Posted a smaller version of a different shot from the same promo set in the past, but this one is worthy of its own post. Not only do we get to see the full extent of that amazing fur, it also suggests it’s possible to see it in the 1932 film Letty Lynton. Or not. Apparently it exists in some sort of legal limbo and that’s why it’s not a staple of TCM’s many Joan Crawford fests. Well, neither is Mannequin or Ice Follies of 1939 anymore, but they have less of an excuse for those. 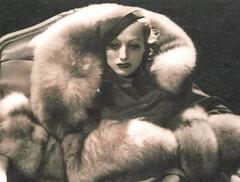 I call on lawyers around the world to free this film, because I really want to see Joan in that fur. In more sad news, it appears Shanghai Lily is no longer on Flickr. I’ve always wondered about the likely tenuous position of these “aggregators,” especially since there’s obvious IP issues with a lot of what they’re posting. Reason it’s probably only a matter of time for many of them. Of course, I’m relying on them for content on this blog, so, by extension, I’m pretty dumb too. There is a clip of Letty Lynton on the internet and I can only say that we people who appreciate such gorgeous furs can console ourselves with the fact that the film has not been restored; in as much as the quality makes it difficult to watch as a film, let alone appreciating the fur. I have found from past experience that photo-stills are often so frustrating as I had assumed that the film would be of the same quality. Saying that, I have saved most film clips to DVD and rejected only a small percentage but I am afraid that Letty Lynton would be one of them. I suppose no one has much reason to tinker with it if it’ll only get them sued.